As part of our 3 month prayer focus – July -September I have attached some notes and scriptures to help us on our way. 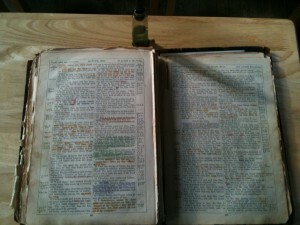 The picture is that of Smith Wigglesworth’s Bible. As you can see it is well annotated and used. Note : if you double click on the picture you can see more detail of his highlighting of John 12 & 13. Q: Does God intend us to be involved in Jesus’ ministry of healing and miracles? A: From our perspective as a Church family we would obviously say YES!. Our problem is that we do not yet see all we believe for. Lets start on our prayer and study journey together and discover how we can see this change to results that are more than we can ask or imagine. 1Jn 3:8(b)…the reason the Son of God appeared was to destroy the devil’s work. Question : What is the devil’s work? Ac 10:38 how God anointed Jesus of Nazareth with the Holy Spirit and power, and how he went around doing good and healing all who were under the power of the devil, because God was with him. Jn 20:21 Again Jesus said, “Peace be with you! As the Father has sent me, I am sending you.”…. Note : Do not simply read it through once…as though it is something you already know all about . Read it several times…feeding on the revealed truths. Meditate on this passage and ask God to open it up to you. Read each verse slowly and take it ALL in. Note: Look at the chapter not simply as a story but imagine that you (yes YOU) are there – part of Jesus’ disciples group. As long as it is day, we must do the works of him who sent me. Notice the we : what significance does that have to us…to you? You’re included ….consider that….us – you and me….what are the consequences? The next time you pray for someone, bring this picture and truth back to mind where you are one of the ‘we’ that Jesus spoke about.